CHARLOTTE – The Carolina Panthers answered a lot of questions with their 38-0 shellacking of the visiting New York Giants. 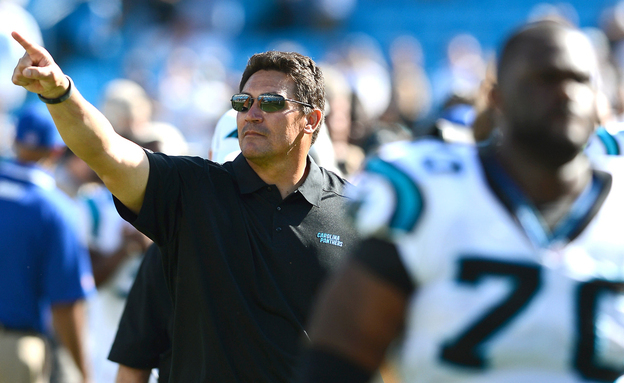 Namely, would Ron Rivera still be the head coach following next week’s bye? Simply put, of course he will. Early in the game, a source within the organization said even if the Panthers had lost to the Giants, Rivera would not be replaced during the season. But, getting the team’s first shutout since 2008 certainly erased those rumors. It was the largest margin of victory in the Panthers’ 19-year history. It also was the Giants’ worst loss under head coach Tom Coughlin. 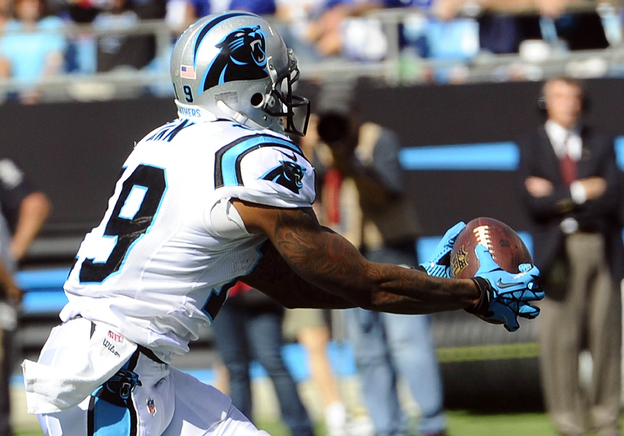 Carolina Panthers’ wide receiver Ted Ginn caught this 47-yard touchdown pass from Cam Newton. Offensively for the Panthers, Cam Newton threw touchdown passes of 16 and 20 yards to Brandon LaFell, and completed a 47-yard pass to the speedster, Ted Ginn, for the Panthers’ final score. DeAngelo Williams rushed for 120 yards on 23 carries. The Panthers’ front four were led by defensive end Greg Hardy, who had three sacks in the first half alone. He repeatedly beat Giants left tackle Will Beatty to put pressure on Giants’ quarterback Eli Manning. 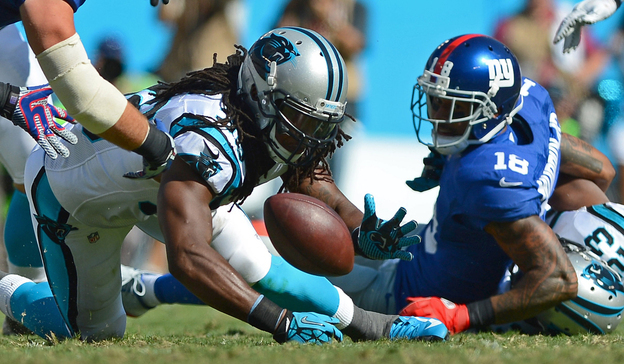 Carolina Panthers undrafted rookie Robert Lester recovered this fumble in the 38-0 win over the New York Giants. The convincing win brings the Panthers record to 1-2 and drops the Giants to 0-3. The Panthers defense came into the game a beat-up group. The secondary was decimated, with just one starter playing. But they helped themselves out a lot today. Given the chance, this motley crew came through with three takeaways. Undrafted rookies Robert Lester and Melvin White accounted for all three. The Panthers’ defensive front line sacked Manning seven times, which tied a franchise mark set six previous times, most recently in a loss last season in Atlanta. The way Rivera finally opened up offensively. He went for it on an early fourth-and-one from the Giants’ 2-yard line. Fullback Mike Tolbert scored standing up and the rout was on. Cam Newton looked like the Cam from the final six games of the 2012 season. Following an early interception, he ran the ball effectively when needed, and threw three touchdown passes. Brandon LaFell finally looking like the receiver the Panthers thought he could be. Two touchdown receptions and he made a tackle at the Carolina 17-yard line following an interception thrown by Newton. 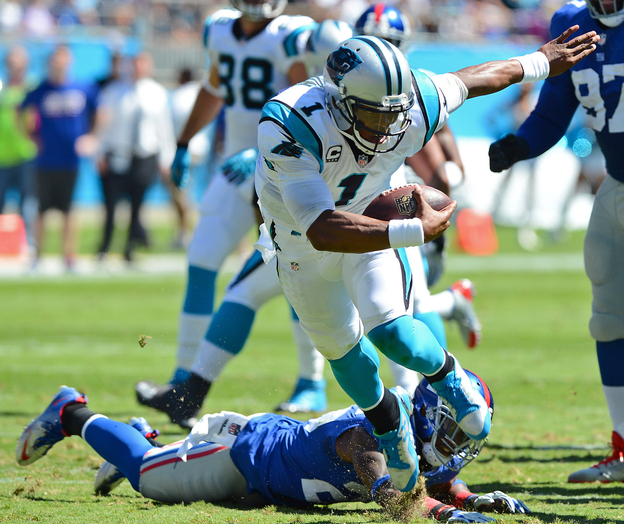 His tackle allowed the Panthers’ defense back on the field where they stuck it to the Giants, not allowing any points. 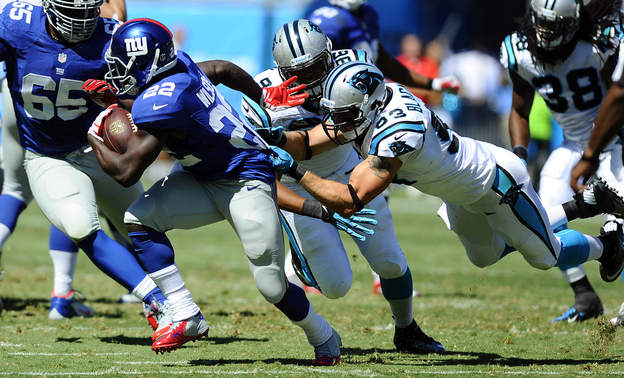 Carolina Panthers linebacker Chase Blackburn tackles David Wilson. The former Giant played well in the Panthers’ 38-0 win. Carolina Panthers’ quarterback Cam Newton ran effectively for the first time this season and threw for three touchdowns leading the Panthers to a 38-0 win over the visiting New York Giants Sunday. Victorious for the first time this season, Carolina Panthers’ head coach Ron Rivera walks off the field following the 38-0 win over the New York Giants. 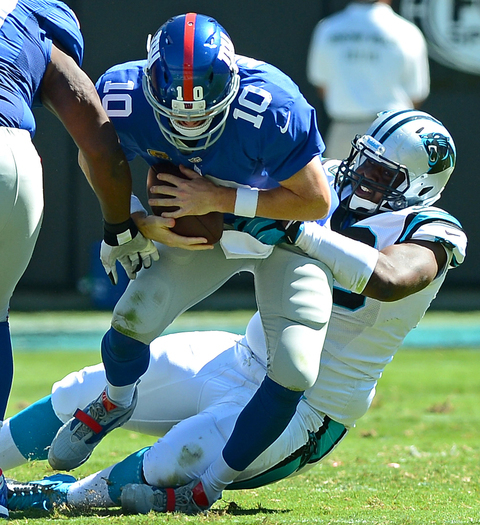 Carolina Panthers’ rookie defensive lineman Kawann Short sacked Eli Manning…one of seven Panthers’ sacks on Sunday’s 38-0 win over the New York Giants. The Panthers are off this week with a bye and return to action at Arizona on Sunday, October 6. The track record for 0-2 teams making the playoffs since 2008 may tell the Carolina Panthers their season is over. But let’s hold off on that. The NFL is full of 1-1 teams right now, including San Francisco, Green Bay and the Super Bowl champions, the Baltimore Ravens. What is telling is that the Panthers continue to lose games they should win. The 24-23 loss to the resurgent Buffalo Bills Sunday (with just :02 seconds remaining in the game) now makes head coach Ron Rivera a huge target. Under his leadership, the Panthers are 2-14 in games decided by a touchdown or less. Since the playoffs expanded to 12 teams in 1990, teams that started the season 0-2 have made the playoffs 11.6% of the time. 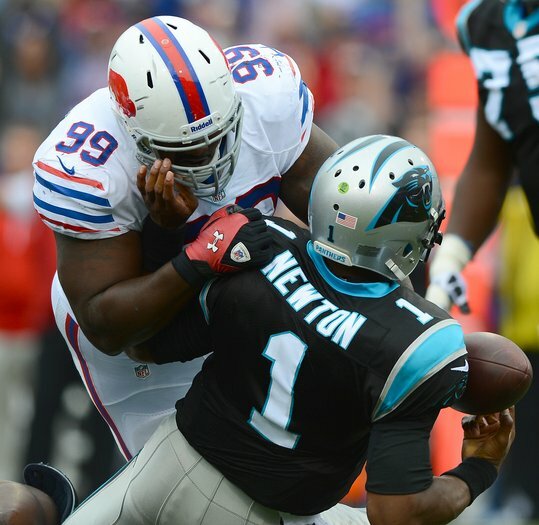 Carolina Panthers quarterback Cam Newton sacked by Buffalo Bills defensive lineman, Marcell Dareus. This was one of six sacks recorded by Buffalo. The offensive line was a sieve, allowing the Bills defense to sack quarterback Cam Newton six times on Sunday. While the Panthers’ offensive brain trust wants to limit Newton’s running this season, his line must provide better protection. His only options, run or be sacked. The offense needs to be more vertical as well, in my opinion. Conservative football is on the wane in the NFL, and with Newton, the Panthers have an outstanding weapon. He is big, strong and has football smarts. Just look at the results in the final six games of the 2012 season and you can see that. While the Panthers have been slow starters for the past two, now three, seasons, speculation, of course, is how long will Rivera remain in charge. Personally, he’s a nice guy who is very open to the media. You can see this team is hurting. But this is a “win now” league, and with Atlanta and New Orleans the big dogs in the NFC South, this team cannot afford to lose Sunday to the similarly smarting New York Football Giants and Eli Manning. 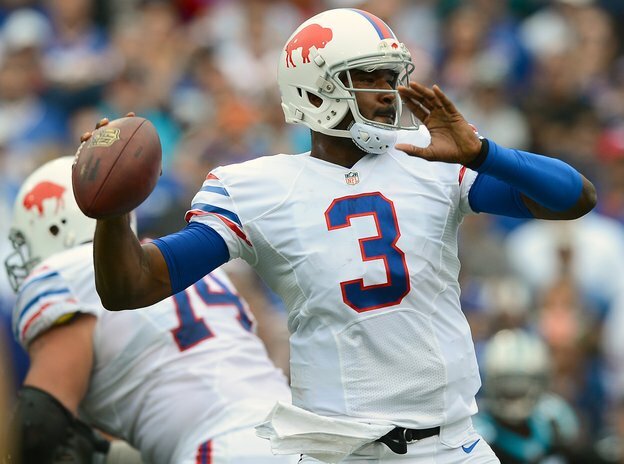 If you thought EJ Manuel, the Bills rookie quarterback had an up-and-down day, maybe you’re right. In the Panthers’ defense, they did lose three-fourths of their secondary to injuries. Free safety Charles Godfrey is probably lost for the season with an Achilles injury. However, Manuel was 27-of-39 for 296 yards and did lead the Bills on a game-winning 80-yard drive to close out the game. So…what do you think Eli will do to the Panthers’ secondary? 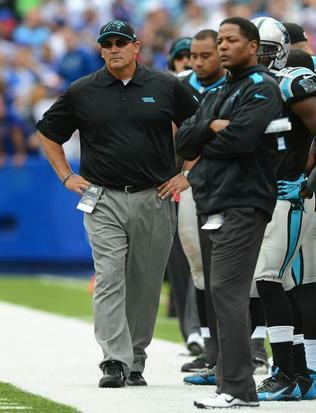 Carolina Panthers’ head coach Ron Rivera is certainly on the hot seat. His team is off to another slow start in 2013. Buffalo Bills rookie quarterback EJ Manuel led his team on an 80-yard drive capped off by a 2-yard touchdown pass to Stevie Johnson with :02 remaining to beat Carolina 24-23 Sunday. It was Manuel’s first win in the NFL. On the Bills’ final drive, it appeared that the Panthers had stopped them on third-and-6 from the Panthers’ 31 with 21 seconds left. Manuel sailed a pass that third-team safety Colin Jones intercepted. But officials ruled Panthers linebacker Luke Kuechly interfered with Johnson, who was Manuel’s target. The Bills were able to run another play…and this one was the dagger. Stevie Johnson, lined up in the slot, ran a corner route, with wideout Chris Hogan coming across the middle. The Panthers were in man coverage, with cornerback Josh Norman lined up across from Hogan and defensive back D.J. Moore on Johnson in the slot. Carolina Panthers tight end Greg Olsen (88) and tackle Jordan Gross (69) react to the Buffalo Bills’ winning touchdown with :02 remaining in the game. The Giants will also be seeking their first win of the season, which makes the upcoming game absolutely crucial for two teams expecting to be in the playoffs this year. Only one will have any kind of chance. CHARLOTTE – The Carolina Panthers went back to a tried and true formula from last year in their 12-7 loss to the Seattle Seahawks Sunday. Stay close and lose. Let me repeat that – stay close and lose. And, the Panthers are not happy about it. This team needs to get off to a quick start – the last two seasons they have started 2-8, and that will be unacceptable for this year’s team. Carolina Panthers running back DeAngelo Williams (34) dives back for the ball after fumbling as Seattle Seahawks Richard Sherman (25) stretches out for the ball. 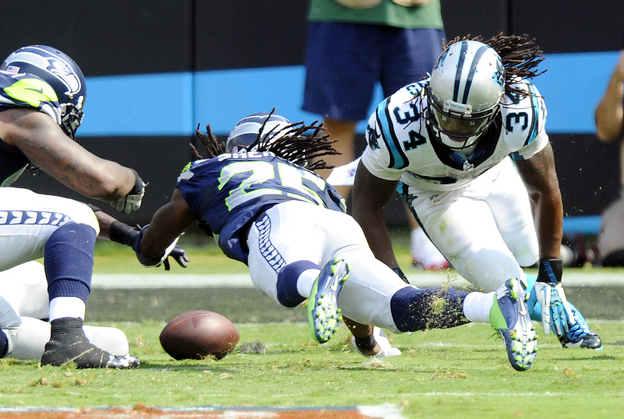 Seattle recovered the ball, ending the Panthers’ chances to win on Sunday. The Panthers were driving for a potential go-ahead score when running back DeAngelo Williams fumbled at the end of a 16-yard run inside the Seattle 10. Cornerback Richard Sherman hit Williams from the front, safety Earl Thomas popped the ball loose from behind, and defensive Tony McDaniel recovered at the Seahawks’ 8 with 5:25 left. Stay close and lose. The announced Bank of America Stadium attendance was 73,294…and none of them came to see a replay of the last two seasons. 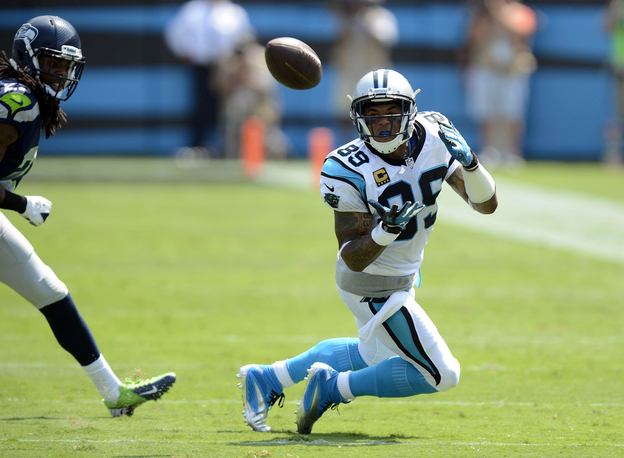 Carolina Panthers receiver Steve Smith making a catch Sunday in a losing effort against the Seattle Seahawks in the Panthers’ home opener. Panthers wide receiver (and most vocal of all Charlotte players) Steve Smith: “I think we’re going to see them again deep in January. For us to have played that team that’s considered by all accounts the best team in the NFL … I think if that’s who’s the best team, it came down to the last (minutes) and it was a well-fought game. Our season is not over. Seattle Seahawks quarterback Russell Wilson (3) being harassed by Panthers Defensive Tackle Colin Cole (91) who is being blocked by Seattle’s J.R. Sweezy (64). Carolina Panthers cornerback Captain Munnerlyn (41) and linebacker Luke Kuechly (59) fight to make a tackle on Seattle Seahawks wide receiver Doug Baldwin (89). The defense played tough, although they allowed Seahawks quarterback Russell Wilson to have a record-setting day. The Panthers return to action next Sunday when they travel to Buffalo to meet the resurgent Bills (who should have beaten New England yesterday) in a critical game. Cam Newton, entering his third year as the Carolina Panthers starting quarterback, has been named as one of six team captains for this season. Head coach Ron Rivera announced the captains prior to Thursday’s practice. 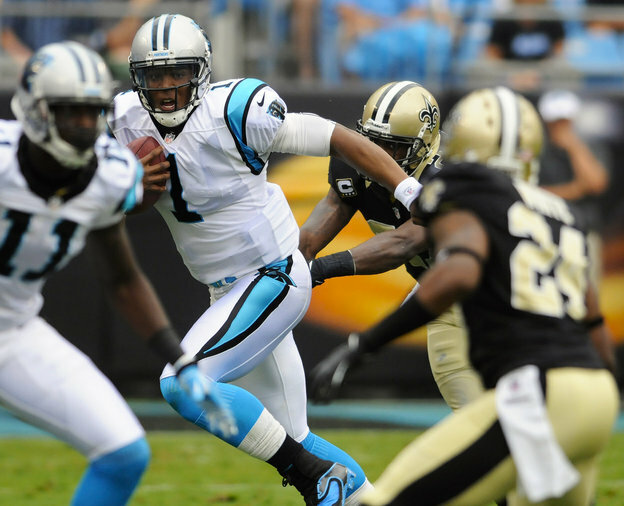 Carolina Panthers quarterback Cam Newton, running in a game last year, has been named as one of six captains for the 2013 squad. In addition to Newton, the other five captains are reigning Defensive Rookie of the Year LB Luke Kuechly, LB Thomas Davis, WR Steve Smith, LT Jordan Gross and C Ryan Kalil. 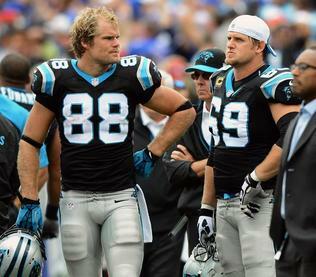 Newton’s captainship reflects on how the 2011 No. 1 overall draft choice has grown over the offseason. He came to camp with a more serious attitude and showed a lot of leadership qualities. 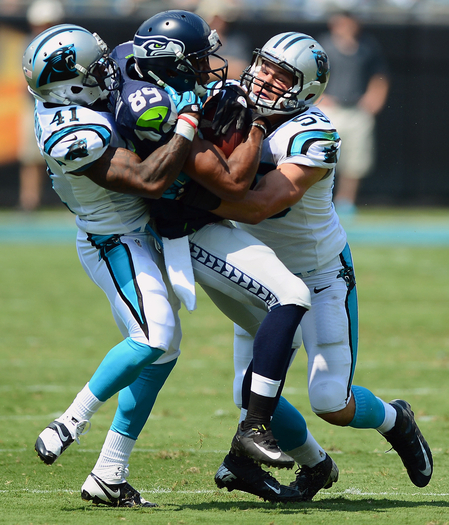 Kuechly, who led the league in tackles last season, is the defensive player everyone follows and gravitates towards. Davis, Smith, Gross and Kalil are the veterans who are showing the way for all players. Gross, Smith and Davis were captains last season as well. 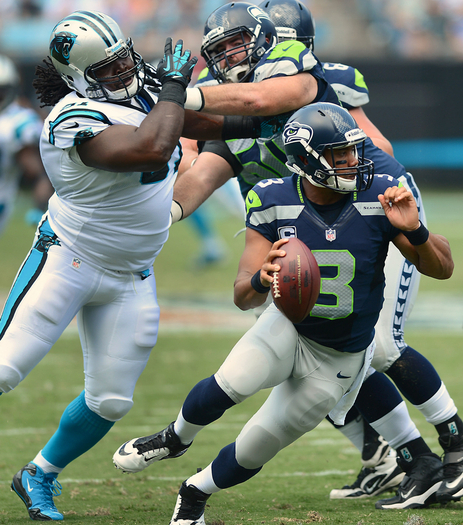 The Panthers open the 2013 season Sunday at home against the Seattle Seahawks.